Purpose: CCCC presents six awards designed to support scholarship dedicated to improving knowledge about the intersections of disability with composition and rhetoric, the value of disability as a source of diversity, inclusive practices and the promotion of access, and the value of disability as a critical lens. 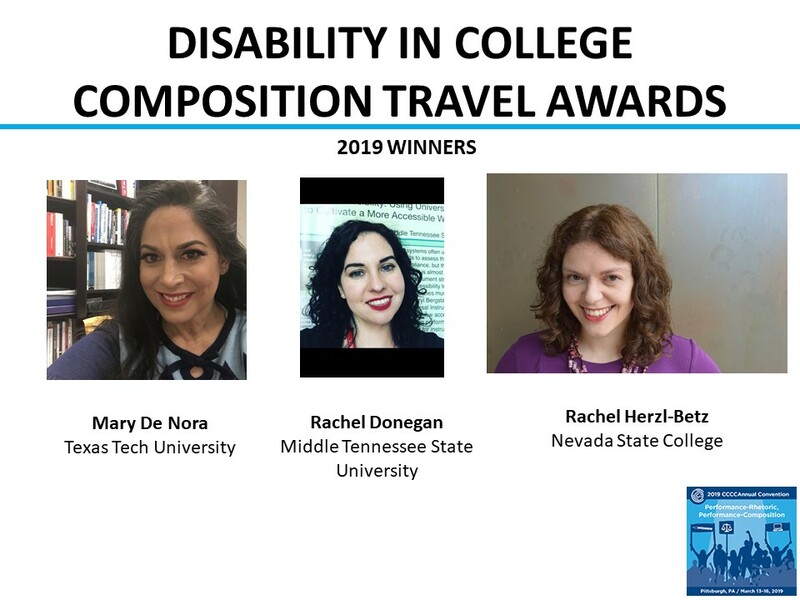 These awards encourage new scholars who investigate issues relating to disability and to the field of composition and rhetoric to present their work at the conference; we hope to recognize the efforts of individuals dedicated to improving the experiences of people with disabilities in the field; and we believe it is important to support scholars with disabilities to travel to share their work. Eligibility: CCCC offers up to three travel awards for graduate students and three travel awards for faculty and staff members. The awards are to be used for travel assistance, based on review of accepted CCCC Annual Convention program proposals. 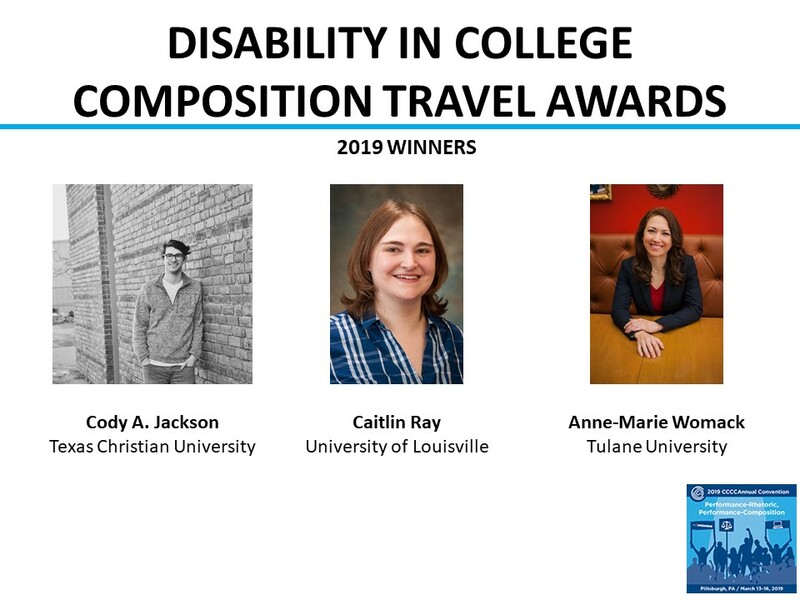 The awards will go to the eligible scholars whose convention program proposals are determined to have the greatest potential to further the goals laid out in the CCCC Policy on Disability. Award Specifics: Self-nominations are invited. Self-nominees must submit a copy of their accepted CCCC convention program proposal and are invited to add an additional 500 words of justification in support of their self-nomination. To nominate an individual, nominators are invited to write up to 500 words of justification in support of the nominee; the nominee will then be asked to provide a copy of their accepted CCCC convention program proposal. Both self-nominations and nominations must include the full contact details of the nominee. Nominations should directly address the nominee’s efforts to further the previously mentioned goals laid out in the CCCC Policy on Disability. Nominations are due by October 10, 2019, and should be emailed as a single PDF attachment to cccc@ncte.org. Clear preference will be given to first-time conference attendees and/or untenured faculty. The travel awards will be in the amount of $750. Award recipients will receive their award at a reception during the annual convention, and will have these awards officially recognized in publications and announcements.